Today’s windows are expected to perform various functions such as letting in light, keeping out heat/cold, noise attenuation, as well as being aesthetically attractive, needing lower maintenance and using energy saving/efficient materials/processes in place of scarce/energy efficient conventional materials. uPVC Windows/Door profiles are made from Poly Vinyl chloride resin, one of the most extensively used thermoplastics finding end uses in diverse sectors such as infrastructure, agriculture, healthcare etc. The hectic lifestyle requires everything around us to be as useful, as durable and as easy to maintain as possible, and, at the same time, aesthetically attractive and energy saving. Today windows and doors are not the exceptions. They, too, have to perform various additional functions like attenuating noise or keeping out the cold. Fortunately, the incorporation of the uPVC framing material allowed to achieve this. uPVC stands for Unplasticized polyvinyl chloride, also known as vinyl siding in the US. The rigidness and durability of this material permits to use it for outside doors and window frames, as it withstands various weather conditions, does not lose shape, keeps heat in during winters and prevents heat from coming into the house through the summer season. uPVC has taken over the USA market in the 1970’s, and currently, it is the most common material for window framing in the world. · uPVC window frames are invented to fit in the insulated double glazing that keeps out the cold and the heat depending on the season. · uPVC profiles for windows and doors need almost no maintenance and have a long lifespan, do not rust or rot and are not affected by the termites. · uPVC material handles severe weather conditions without difficulty. · uPVC has 57% salt content so that it is perfectly suitable for coastal areas. · Fusion welding prevents drafts and water leaks. · Different combinations of glass, together with uPVC frames considerably reduce outside noises. 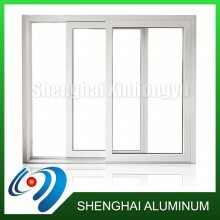 Order custom-made uPVC window frames from Foshan Shenghai Aluminum Co.
We manufacture and sell the series of window and door frames made of uPVC that vary in height, width, color, surface treatment, and glazing. Moreover, our producing capacities allow creating frames according to the specific sizes stated in the order. The manufacturing process is strictly supervised to meet all national standards and quickly complete orders. When you choose Foshan Shenghai Aluminum Co., you receive the guarantee of quality and on time delivery. Contact us and order straight from the uPVC window frames manufacturer to receive the desirable result.